Today the Inklings will be heading down into the dungeons. We have been talking about The Dungeoneers by John David Anderson and working on creating Dungeoneer inspired roll playing characters. Now we are nearly ready to send our first four into the dungeons. I am super excited to act as the Dungeon Master and see if these rogues, barbarians, druids and magelings can survive. While the four Dungeoneers are working their way through my beautiful dungeon, the rest of the Inklings will be working with this Dungeoneer online game. I will be asking about your experience with the online game and what sorts of treasure you can score, so do your best. Yesterday we finally were able to have an Inklings meeting, we have been waiting since December for this meeting. So yesterday we introduced our new read, the wonderful Dungeoneers by John David Anderson. The Dungeouneers is a great riff on the world of Dungeon and Dragons. The story is funny, and full of magical adventure. It is a perfect book for the Inklings to get into and do some excellent reading challenges with. Now, let’s do a little sharing, I have to say that I have been a devoted sci-fi/fantasy devotee for most of my life. I nearly killed my little brother with he chewed the feet of my Greedo action figure and he wouldn’t stand up anymore. I had both D&D and a role playing Star Trek game, and a sizable collection of multi-sided dice. It’s very safe to say that I was a nerd or geek or what ever you wanted to call me. So as I was reading The Dungeoneers I immediately knew that the Inklings would dive fully into the world of role play adventures. I didn’t want to just get into Dungeon and Dragons or some other stock game, I wanted to make it our own. So I took some of the basics from The Dungeoneers to help me build the character sheet. Everything on our character sheets were left up to chance. 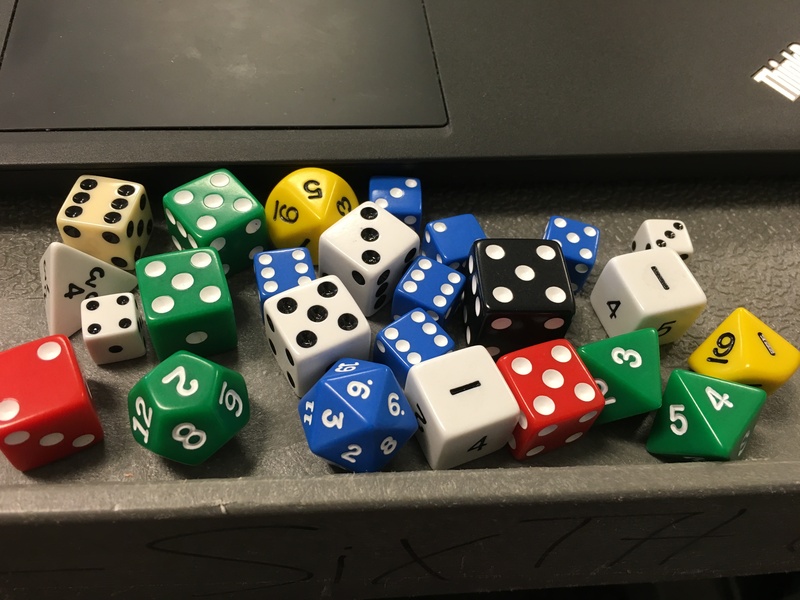 We used dice to determine almost everything, and then used a D&D name generator to come up with our names and race. It certainly lead to some crazy characters. How about Jartra, the half-ogre mage, with an intelligence of 9 and a charisma of 32, or Adolamin Beestinger a 1’4″ gnome mage? We are going to have some great fun when we take these Dungeoneers into their first Dungeon in two weeks. So why not build your own Dungeoneer character, just roll that 1D4 to see if you get to play the rogue, mage, barbarian or druid? We play on March 2nd!